A stellium is when 3,4 or more planets are found in 1 sign. Today’s New Moon highlights a whopping 6 planets in Aries, including the Sun and the Moon. In a natal chart, a stellium in a sign represents a tremendous focus of energy placed on the needs and values of that sign. 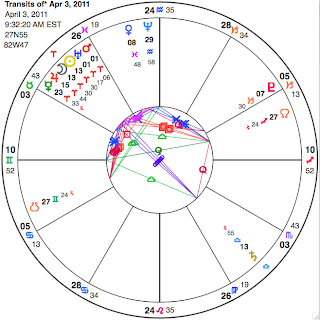 For a New Moon chart like the one above, which represents the quality of the new monthly cycle about to begin, we can appreciate the emphasis on Aries as indicative of taking an action or a stand, in order to begin in a new direction. In this horoscope, 8 of the 10 main astrological bodies are found in Cardinal signs (Aries, Cancer, Libra, Capricorn), representing a new beginning. The New Moon conjunction itself is opposed exactly by Saturn in Libra, illuminating the importance of concrete, committed action (Saturn) with awareness of others (Libra), with full awareness of the consequence. Taking together with the Aries stellium, this pattern could suggest bold, assertive (if not aggressive) action or stand taken against others in order to protect one’s individual integrity. Do you feel an urge to make a new beginning? What sort of change is in the air? Where do you feel the need to take a stand, to draw a line in the sand? Please feel free to share through emails or comments. Anyway, thank you for your advice. That's a good Capricorn stellium….Now, where does lottery come in? :) Seriously, you could be working hard and getting a lot accomplished this month — but alas, planets can't do it for you…. I think this part of what you say is a very apt expression of the New Moon chart: "I just want to give everything up and do whatever I feel like doing (Aries) because it feel like no matter what I do I'm going to get the short end of the stick anyway. (Saturn)"
In this case, the hopelessness regarding your vocation (the lower expression of Saturn) needs to be addressed (and, hopefully, transformed into meaningful goals and ambition) before changes can be made. The new moon in Aries seems to have landed in my 10th house. It's sesquisquare my N. Sun, quincunx my N. Moon, trine N. Mercury, square N Venus, trine N. Mars, quincunx N. Uranus, trine N. Neptune, opposite N. Pluto, square N. Ascendant. Even though I've been feeling more creative lately. I haven't been feeling like I need to change my direction, I just feel hopeless in the vocation that I've chosen to go to college for. Though I love doing it. I just want to give everything up and do whatever I feel like doing because it feel like no matter what I do I'm going to get the short end of the stick anyway. I'm assuming a person finds the new moon placement through transits so I hope I have it's placement in my chart correct. My birthdate is 11/15/1976 time is 7pm and place is La Mesa California if you think I got it wrong. I use Koch. Anyway, I find it interesting that I seem to be doing the exact opposite of what this transit implies.